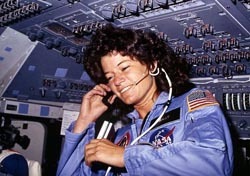 Sally Ride joined NASA in 1978 and became the first American woman to enter into low Earth orbit in 1983. She died Monday after a 17- month battle with pancreatic cancer. Ride, along with Amelia Earhart and many others, are pioneers who inspired generations of women. Female pioneers like Earhart and Ride have a powerful hold on our imaginations. They’re icons of courage and perseverance. They’re role models for young people, especially women. Earhart and Ride are part of a tradition of women who discovered parts of the world that no man (or woman) had gone before, including Alison Hargreaves, who climbed Everest without oxygen (and several other mountains while heavily pregnant); Helen Thayer, who lived for a year with a wolf pack in the Arctic Circle; and Nellie Bly, who took a record-breaking trip around the world 72 days and wrote a ground breaking exposé in which she faked insanity to study a mental institution from the inside. Women should celebrate these amazing women and don’t allow History to forget them so they get the recognition they deserve!